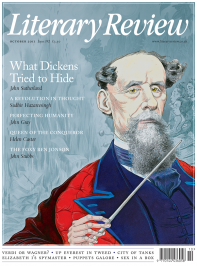 Literary Review has a new look and we hope you’ll share our enthusiasm for it. Chris Riddell, who succeeded Willie Rushton as our cover artist in February 1997, will continue to provide us with his witty and colourful encapsulations of our lead review, but with a larger canvas at his disposal. The pages inside have also had a facelift. The contents remain exactly as before in terms of the quality, number and length of reviews, but the page, reset in Caslon, is less cluttered with lines and boxes; the illustrations will be larger and clearer, and we plan to include some more cartoons. The review headings constitute the only text not set in Caslon; they are set in Janet, which the artist and typographer Reynolds Stone designed and named after his wife. Newly digitised, it is based on characters that were engraved rather than drawn, giving it a distinctive feel. And finally, readers who have felt frustrated by the rather arbitrary nature of our notes on contributors will be pleased to learn that, from now on, everyone will be included.